Sold in over 30 countries, Amino Fruit Antioxidants (or AFAs) are available exclusively through Dermatologists, Plastic Surgeons and Cosmetic Physicians. AFAs are formulated with a patented blend of natural amino fruit antioxidants to work synergistically with filaggrin – a protein of the epidermis which metabolizes into amino acids and act as the primary agent for retaining moisture in the skin. Through this high-effective formula, AFA products repair and refine skin with minimal irritation, making them an ideal solution for patients with all skin types who are experiencing acne, signs of aging or sun damage. None of the skin care products in the AFA line are tested on animals. 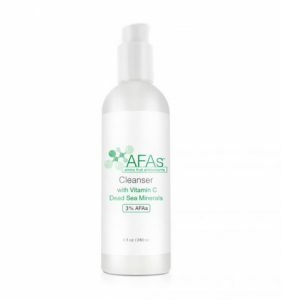 AFA Gentle Cleanser is a foaming, milky cleanser that thoroughly cleans the skin and effectively removes makeup, excess oil, and other impurities. Carefully formulated with a concentrated blend of amino fruit antioxidants, L-ascorbic acid (vitamin C) and Dead Sea Minerals, the AFA Gentle Cleanser optimizes the skin’s moisture levels, leaving skin soft, clean and never dry or tight. The AFA Gentle Cleanser balances and refreshes skin while prepping it to receive other AFA treatments for maximum results. 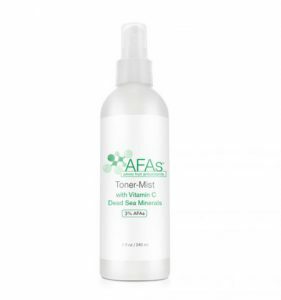 The AFA Toner Mist combines amino fruit antioxidants, L-Ascorbic acid (vitamin C), and Dead Sea Minerals to refresh, rejuvenate and promote hydration while soothing the skin. This mist is alcohol-free, non-astringent and is designed for all skin types, making it a perfect step during and after in-office and clinical procedures. In addition to balancing the skin’s pH levels, it can also be used after makeup application as a setting mist. AFA Oil-Free Moisturizer is fortified with amino fruit antioxidants, L-ascorbic acid (Vitamin C), and Dead Sea minerals to hydrate the skin while delivering protective antioxidant benefits. Its lightweight texture, soothing properties and fast absorption rate make this moisturizer ideal for patients with oily skin. 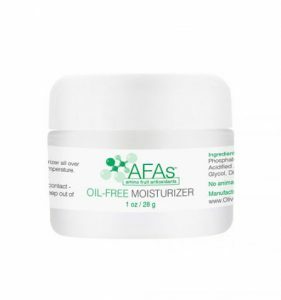 The AFA Oil-Free Moisturizer is hypoallergenic, non-comedogenic, and fragrance-free. 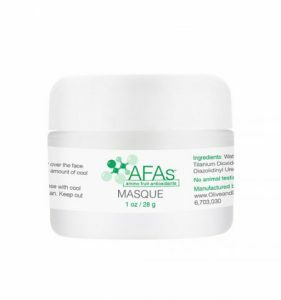 AFA Micro Exfoliating Masque is a weekly, rejuvenating masque that is formulated with a blend of amino fruit antioxidants to purify and firm the complexion. This creamy textured masque dries on the skin to help clear pores of dead cells, excess oils and other impurities. With weekly application, this masque reduces the appearance of sun damage, while improving overall skin tone. Gel Mild 11% is a gentle exfoliator that encourages cell renewal with our most mild formula. The blend of amino acids addresses typical signs of aging and reduces the look of enlarged pores. Because Gel Mild 11% is not harsh or abrasive, this treatment product does not leave skin irritated, dry or tight. Gel Mild 11% contains amino fruit acids that renew the complexion and improve the skin’s ability to retain moisture. After a few applications, this skin exfoliator creates a more refined tone and texture along with a refreshed appearance. The formula also contains vitamin C in support of collagen production. AFA Gels are non-comedogenic, fragrance-free, and hypoallergenic. It is preferred to start out with either the ExZit or Gel Mild in any regimen, even if you have used other glycolic acid products as these are stronger than other products. Reduce the look of fine lines, enlarged pores and more with this gentle, yet powerful exfoliator. The second step in our graduated treatment options, the AFA Gel Plus 15% is formulated with a patented blend of 15% amino fruit antioxidants to rejuvenate the complexion and L-ascorbic acid (vitamin C) to support collagen production. AFA Gel Plus 15% offers patients increased exfoliation benefits without leaving skin feeling dry, tight or irritated. AFA gels are non-comedogenic, fragrance-free, and hypoallergenic. 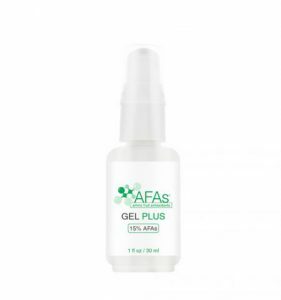 AFA Gel Plus 15% is a graduated treatment product and should only be considered for use once you have been through an entire treatment course (one bottle) of the AFA Gel Mild 11%. AFA Gel Max 19% is our most potent and efficacious at-home use product to improve acne, reduce wrinkles and improve the overall texture of the skin. This powerful gel formula contains a patented formula of 19% amino fruit antioxidants to help revive and exfoliate the skin. AFA Gel Max 19% is expertly balanced to take full advantage of the benefits of low pH to ensure maximum patient benefit, while effectively guarding against irritation and redness. Patients using AFA Gel Max 19% will experience concentrated benefits leading to improved tone and texture, reduction in fine lines and a minimization of free radical damage. AFA gels are non-comedogenic, fragrance-free, and hypoallergenic. AFA Gel Max 19% is a graduated treatment product and should only be considered for use once you have been through an entire treatment course (one bottle) of the AFA Gel Mild 11% and AFA Gel Plus 15%.